Another person asked me online for some health benefits of Zumba. I would LOVE to talk about that today because there are so many health benefits of Zumba. The first, probably most obvious, health benefit is the calorie burn. Zumba gives a HUGE calorie burn, as I discussed in my post about the calories Zumba burns. Another health benefit is muscle toning. See, in Zumba, even without weights, you will be using lots of muscles. Without realizing it, you will be doing squats, presses, and more just by doing the dance moves. Add to that a Zumba Toning class or two and you will really get the benefit of toning. Another health benefit is coordination and balance. By learning the dances, you will be improving your coordination and balance. It is a skill to move your hips, arms, and feet all at the same time! It takes a lot of coordination. Also in Zumba, there are many moves that work on your balance as you jump and land, do things on one foot, and much more. Coordination and balance decrease with age, so these are health benefits that can be important to those over 40. The last health benefit is the endorphin release. 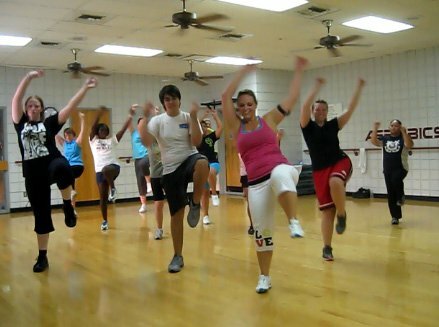 Zumba just makes people happy! While any workout will boost your mood, Zumba will keep you smiling and having a blast for the whole hour (or however long your class is) and it will really lift your spirits. I’m doing the 30 day shred right now but will definitely be moving to classes! Thanks for these insights into Zumba. I loved it when I’ve tried it and will certainly be giving it a go again!